We have finally made it to the spring 2015 clay season! Before we turn our attention to Europe and Roland Garros, let's stop to take a closer look at FILA. FILA-sponsored tennis players have been ascendant over the past couple weeks. 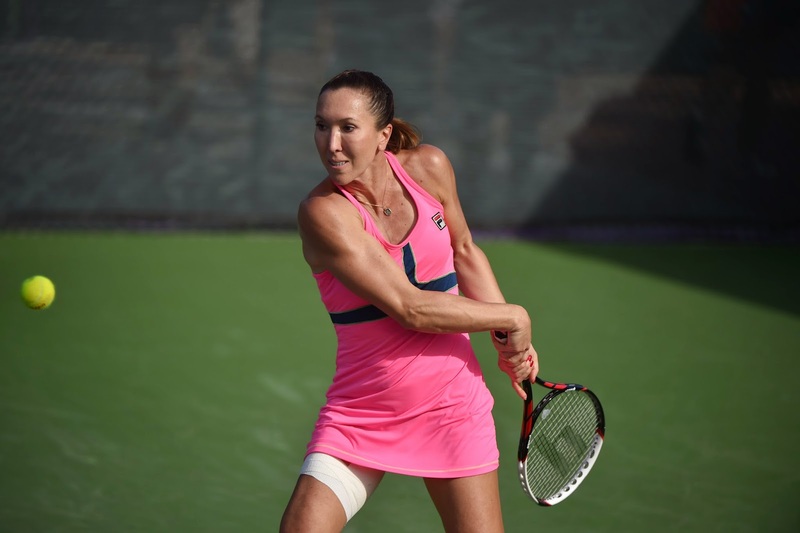 At Indian Wells, Jelena Jankovic was the runner-up at the BNP Paribas Open. Sam Querrey was a Finalist in this weekend's U.S. Men's Clay Court Championship held down in Houston, Texas. Jelena and Sam rocked FILA's latest, brightly-hued designs. Jelena wore a pink dress from the very popular Ready, Set, Glow! collection, while Sam sported a top and shorts from the Suit Up collection this Spring. In addition to outfitting tennis pros in hi-tech, stylish designs, FILA also served as a sponsor at both tournaments. GlamSpinTennis spoke to Lauren Mallon, the Senior Marketing Manager/Tennis at FILA, to get some insight into FILA's partnership with the BNP Paribas Open. FILA has been an Official Supplier to the Indian Wells tournament since 1998. The apparel-maker works with the tournament to design a uniform collection for the ball kids, lines persons, and volunteers at this desert stop on the WTA and ATP tours. Indian Wells is a premier destination for the tennis pros, fans, and television broadcasters from across the globe. 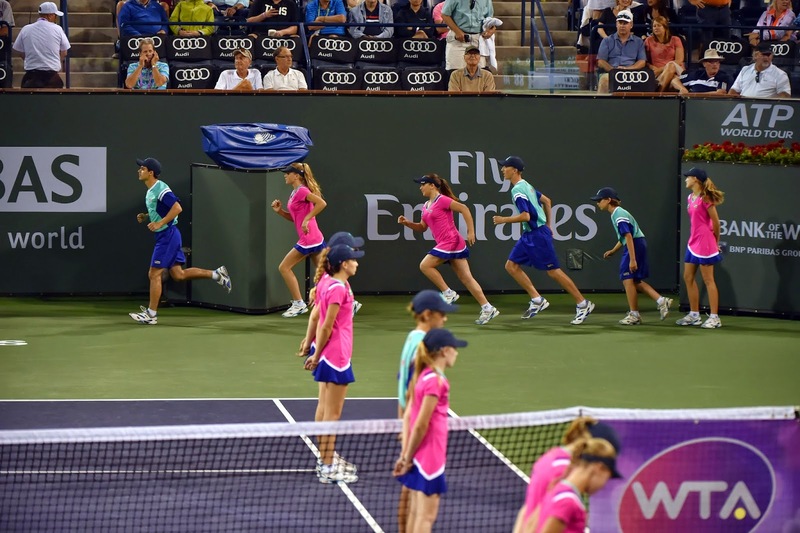 Watching matches in-person, on TV, or streaming on the Internet, one is hard-pressed to miss the FILA logo, featured conspicuously on linesmen, ball kids, and court-side officials. As the official apparel and footwear provider at the tournament, FILA designers work with tournament officials to design a uniform collection that is "athletic and figure-flattering," and in a "unique color-palate"according to Mallon. According to Mallon, the Uniform Collection design and production process takes approximately 10 months. Discussions between FILA and the tournament about the color palate and designs begin May of the preceding year while production begins in early August. This year's Uniform Collection featured a flirt skirt-bottom with flounce in pink and contrast color shorts in navy for Ball Girls. Ball Boys were outfitted in a high v-neck in "scuba blue, twilight and white." This year, as an Official Supplier to the BNP Paribas Open, FILA promoted its new #startaracket campaign. FILA #STARTARACKET from FILA on Vimeo. FILA held a clinic and Q&A session with Sam Querrey for local children, had an official unveiling of new FILA designs with at an on-site fashion presentation, and held a Q&A with FILA's head designer for attendees.